The last week has been all about flooring prep. 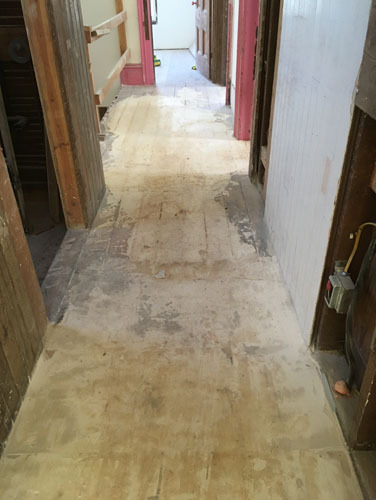 The flooring subcontractor went through and sanded all the floors. This worked great in the kitchen (the former dining room). 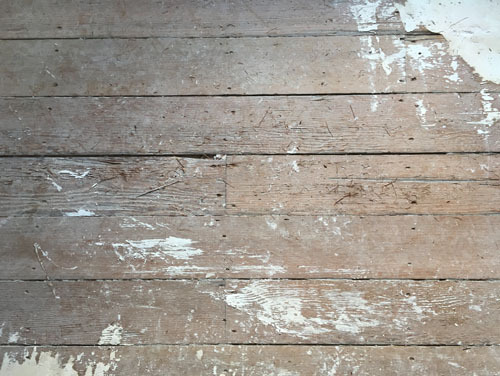 The floor in this room is not in as bad a condition as in the older part of the original house, as in you can't actually see through the cracks in the floor. 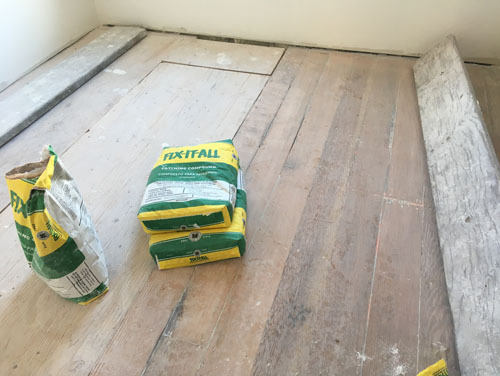 In addition to sanding, they were evening the floor out with flowable floor filler. That gives them a completely flat, solid surface to attach the underlayment. Some areas, where the floor was in the worst shape, needed a lot of filler. 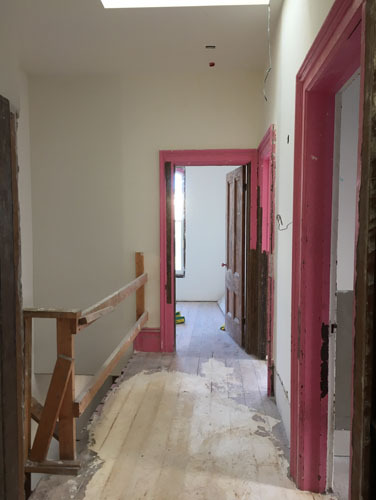 The hallway had the original flooring and it was terribly dented up and damaged, plus the gaps between the boards were up to 1/4" wide. There's quite a lot of filler there. They weren't quite done in the Accordion Room, so you can see the sacks of filler here. This room will have a tile floor in the future (because it's becoming a bathroom, and I generally don't like wood floors in rooms with a tub). That tile should be on site this week, at which time all the tile will be here and done, unlike the doorknobs. 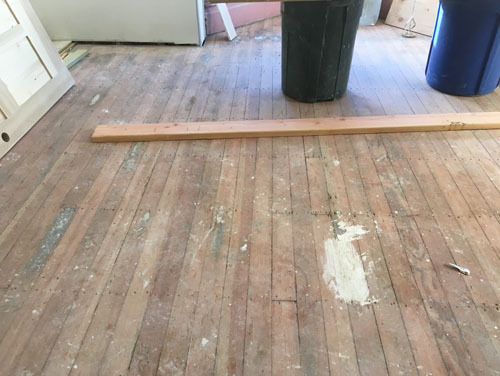 If you're wondering why they are going through this business instead of just lifting the floor boards, it's because the floor boards run under the walls and are integral to the structure of the house, so they cannot be lifted, they cannot be tightened up to each other, and they cannot be easily repaired. 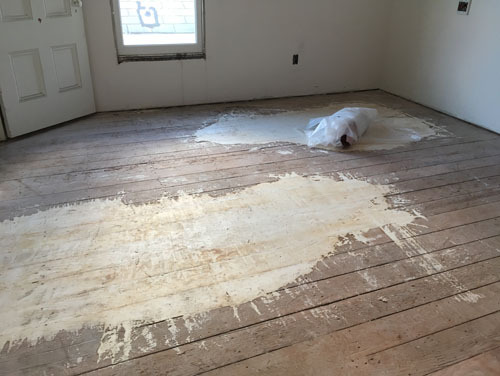 I didn't like the idea of completely gutting the interior of the house, but something had to be done about the flooring. Our only option was to go up. So up we go, which does require some modifications to the doors and such, but given the insane things the previous owners did to the doors that isn't too drastic. And just one final image to show you the best tiny decision I've ever made: the skylight in the upstairs hall. This brings in so much light. The dark, sad hallway is bright and pleasant. And yeah, look at all that floor filler. Can I just comment as to how appropriate the brand of your filler is? Also, where can I get a bag of "Fix It All". Because that seems like it would be awfully handy. This is so true. We saw this for the first time ages ago and made the same comment, along the lines of just pouring the stuff over the house and seeing what happened. It's available at most stores that sell flooring. Hi Ayse, it looks like one of the photos got swapped out on this post with a later one of the exterior window repair. I've been re-reading the archives, and the progress is just stunning.